Twist one: Reflect on the theme of ‘Lost and found’. Twist two: Address one of your worst fears. Write this post in a style that’s different from your own. I’m combining both assignments today, by writing about both loss and fear, partly in my own voice, and partly in another voice. The most terrible loss is losing oneself. Looking into a mirror and seeing someone else stare back, someone who we don’t know; someone who has grown distant, and absent, and can’t remember his name, or recognize his own voice. We first realized there was something wrong when he couldn’t find his way out of a room or into the bathroom. It was as if he couldn’t see the door, or turn around, but he could see, and he could move, only the door was meaningless to him. He had forgotten doors are entrances and exits. His world had become one long, one-way tunnel, in which each step taken disappeared behind him, never to be retrieved. My father died as a result of frontotemporal dementia, and so did two of my aunts. It could be one of the cards I’ll be dealt. My frightened fingers tremble as I admit it’s my greatest fear. There’s no cure, at the moment, and it’s painfully invalidating. It could be equally burdening for those who love me, and I wouldn’t like to be a burden. I wouldn’t like to forget my children, or my grandchildren, but worst of all, I wouldn’t like to forget myself. 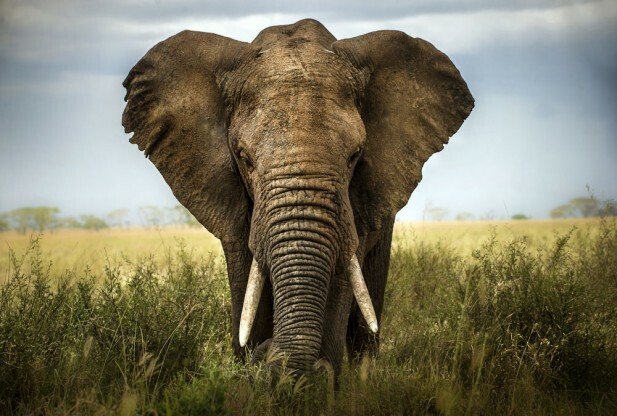 My voice today, is the voice of a man who believes he is an elephant, an elephant who has left his herd and is on his way to the legendary graveyard where aged and dying elephants, like him, retreat to die. They say there is a supernatural force which leads them there, but it has never been found, which does not mean it does not exist. ‘I knew I’d become an elephant one day. Other animals don’t understand elephants. It’s lonely being an elephant surrounded by these other, strange creatures. They trapped me on my way to the sacred place, but they can’t stop me. I’ll get there in the end. I’ve taken a special dislike to zebras. They stare at me and prod me with painful instruments, and make squealing noises. I don’t like their stripes or their long manes and bushy tails. I’m stronger than they are, but I’m alone, and although they’re weaker, there are so many of them that they’ve got braver. They’ve tied me to the bed, but I’ll be breaking free soon. Occasionally lions come into my room and roar at me, but I know that lions wouldn’t dare attack an adult elephant, like me. I can make a long, hollow sound by blowing my trumpet, which frightens them away. Sometimes monkeys drop by. They sit on a chair and stare most of the time. Sometimes they chatter and screech, not at me, of course, they do that amongst themselves. I can see my long curved ivory tusks reflected in the window by my bed, they are what makes us special. They will save the earth when we are gone. My comrades are calling me, and I have to join them in our secret place where the rest of the herd and the other animals will never find us. Wow! Powerful stuff here. The part where you write “I wouldn’t like to forget myself” sent a chill up my spine. Thank you for this! Yes, it’s very disquieting when it happens to someone who is close to you. Thanks for commenting! a brave post, well done. I think one of the great things about our access to blogging and social media of all kinds is that people in every country in the world who might be facing the same issues can find others and talk, discuss and help. keep talking. I love the way and message and feeling you put in your last paragraph. It really impressed me. I love the picture you’ve drawn of a man losing himself but becoming an elephant. Dementia is an awful thing, There’s just no way to make it easy, but you’ve at least made it understandable. Thank you for your comment. Fortunately there’s more awareness nowadays, which helps sufferers, carers, and family. The deeply personal often touches a universal chord. Thank you for this wonderful post. As a carer for my mum-in-law with dementia, I am more frightened of my husband getting it than of getting it myself. He has a terrible memory anyway and am always worrying whether it is a sign of things to come decades down the line. It’s a big worry when it ‘runs in the family’, but my dad always had a good memory, and he was very intelligent. He spoke several languages, had a degree in Business, worked in a bank for most of his life, and was a whizard with numbers, so I don’t think that’s a sign in itself. I wonder if there is a correlation between having a bad memory in life and being more prone to dementia later…? Thank you. He died six years ago. Your mother-in-law is lucky to have someone in the family who understands her illness, and is able to look after her. The courage it must’ve taken to give the back story to your piece – I applaud you. Facing our worst fears are the scariest kind. I fell in love with the elephant and so wanted to save him. To at least ease his journey so he wasn’t being roared at by the lions. Yes, facing fear is not easy, but I’m surprised how liberating it has been doing so on my blog. I never imagined I’d receive so much feedback and encouragement on this post. Thank you! My father wore the ‘frightened’ look, as if he were on another planet surrounded by strange people and things, all the time towards the end. It was very traumatic, in hospital, but fortunately for him, this final stage did not last too long. I was sure that if you nominated Ronovan, whose posts I look forward to, you had to be someone worth following, too! There is a special place in my heart for people who are diagnosed with dementia and the various forms they are finding out about now. I lost someone dear to me with the same diagnoses. I actually wrote about it recently, but not in an open way that you have done here. I believe that is why your post was so very touching to me, and encouraging because of the strength I know it takes to be open. I’m glad to hear you are feeling liberated here in this community of writers. I graciously thank you for visiting and following my blog. I’m pretty random at times so there is no real telling what topics there will be to read. I look at it as a surprise – sometimes even for me. Thank you! I’m pleased to meet you, and I also look forward to reading your posts. So sad and so scary as well. You did a wonderful job of writing in another voice – a voice that spoke volumes for what your father must have gone through. Thank you for directing me here.